I had my period last November 11 and guess what? I think the Vitex is working. Why did I say so? because this time I did not have any menstrual cramp or any menstrual pain as in NO PMS at all. My period lasted for 7 days and surprisingly it is not as heavy as my normal periods before. So, yes I can say Vitex is slowly working and I'm hoping I'll get a positive result someday soon! So far, from July to September my cycle count is 69 days, from September to November-it was reduced to 52 days. I can't wait for next month :) I hope I'm slowly getting at least a shorter CD and a regular one. My husband took another additional vitamins (Rogin-E) and next month I will also add Vitamin E with Selenium to my supplements. I really hope this all work together and that we will have our gift soon. Please keep on praying for us. We’ve been planning to buy a new set of wedding rings for us ( our rings doesn’t fit us anymore plus we both want them replace talaga ten years from our wedding date) You see, ours was not the pricey wedding ring but nonetheless, it was a symbol of our infinite love for each other (naks!) so I’ve learned to like them na. 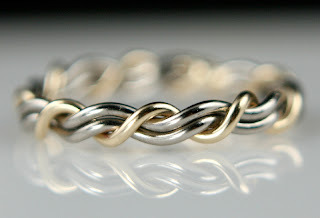 But if only I had money when we got married I’ll definitely choose one that I love-I’ll go for unique wedding bands like this three cord wedding ring! Three cord was mentioned in the bible . Ecclesiastes 4:12 says “Though one may be overpowered, two can defend themselves. A cord of three strands is not quickly broken." Very fitting for a Christian wedding right? How I wish I can have those. But who knows? Looking at the prices of these unique wedding rings, I know they are not cheap (if you convert them into pesos) but they are not too pricey either. If we really want it and save for it, I know we can have them in the near future Think positive Raquel :D I can even order them online if I want and they have a 30 day risk free return policy. Now, I have to print these, get my husband’s approval and pin it on our prayer wall.